Being a racist is not enough to invalidate academic freedom. For the record. Dear Mr. Hough - You are wrong. Also, yes, they are racist. What's more, he has a history of making comments on race that betray a consistent rhetoric of racial inferiority for African Americans. And yet, of course, I'm here to talk about academic freedom. As I've said many times, academic freedom does not guarantee complete impunity for consequences of one's speech. It does, however, guarantee due process and a very, very, high bar for any speech act to be determined as actionable by one's employer. What happens next? Here's what I wrote about a homophobic FSU professor last fall. [O'Connor] does not seem to have been granted the kind of due process usually called for by advocates of academic freedom. Indeed, one of the most consistent criticisms of the University of Illinois was that even if one believed that Salaita’s tweets constituted grounds for rescinding his job offer, he should have been allowed to respond to accusations as part of that process. I agree with that criticism. I wonder whether O’Connor was offered a process in the event she chose not to resign (FSU will not comment on personnel issues). 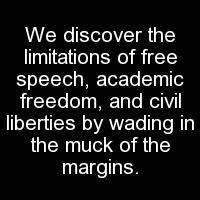 We discover the limitations of free speech, academic freedom, and civil liberties by wading in the muck of the margins. There needs to be a clear process. The bar for firing someone over speech must be VERY high. My gut says that these comments do not clear that bar, as repellent as they are. My gut reaction though is irrelevant, as what matters here is process, transparency, and not letting an attack on Hough undermine a broader defense of academic freedom. It's probable that no black student would want to take a class with Hough, but I'm troubled by the idea that a theoretical future "feeling uncomfortable" with a professor be allowed to enable firing, whether tenured or not. Because anyone could theoretically say that in the future they might feel uncomfortable with someone over their stated public positions; indeed, in other free-speech cases (Gundy, Salaita), groups of conservatives have made just that argument. A hypothetical future discomfort cannot be proven or disproven. It doesn't clear the bar. But you know what does clear the bar? Discrimination. Hough has a long history of Duke. I believe it is now the job of the university to look for clear evidence of discrimination by Hough against black students (or any group of students). It's not about speech. It's about actions. Also, I hate writing these posts. I really just want to shout and rant, but here I am again, wading in the much of the margins.